This recipe is adapted from the January 2007 issue of Gourmet. I’ve changed only a couple of things, including the oven temperature, which I found was too high for my cast-iron pots. They held the heat so well — at 325 degrees, the simmer was too hard — that I had to reduce the cooking temperature to 300 degrees. Raise it back to 325 degrees, as stated in the original recipe, if your pot roast does not maintain a gentle simmer. Put oven rack in middle position and preheat oven to 300 degrees. Heat oil in pot over moderately high heat until hot but not smoking. Meanwhile, pat meat dry and sprinkle with salt and pepper. In the heavy ovenproof pot, brown the meat in hot oil on all sides, about 10 minutes total. (If the bottom of the pot begins to scorch, lower the heat to medium.) Transfer meat to a plate using a fork and tongs. Pour off half the oil. Add pancetta to oil in pot and sauté over moderately high heat, stirring frequently, until browned and fat is rendered, about 3 minutes. (If using prosciutto, add it to the pot with the onion, carrot and celery.) Add onion, carrot, and celery, and sauté, stirring occasionally, until vegetables are softened and golden-brown. Add garlic, thyme, and rosemary, and sauté, stirring, until garlic begins to soften. Stir in tomato paste and cook, stirring, 1 minute. Add wine and boil until liquid is reduced by about one-third. Add water and bring to a simmer. At this point the cooking liquid should taste lightly salted. Return meat along with any juices accumulated to the pot. Cover pot with lid and transfer to oven. Braise until meat is very tender, 2½ to 3 hours. Cool completely in sauce, uncovered, and then chill, covered, for 2 to 3 days. Flip the meat every day so it absorbs the cooking liquid evenly. For serving, discard fat from the surface of the sauce, along with the herb stems. Cut meat across the grain into ½ inch slices, removing excess fat as desired. If the sauce needs thickening, boil it over high heat until reduced by about one-third. Season with salt. Return meat slices to sauce and reheat, covered, in a 350-degrees oven. Serve accompanied with soft polenta or red potatoes (unpeeled) mashed with crème fraîche. Substituting smoked bacon for the pancetta can overwhelm the flavor of the wine. 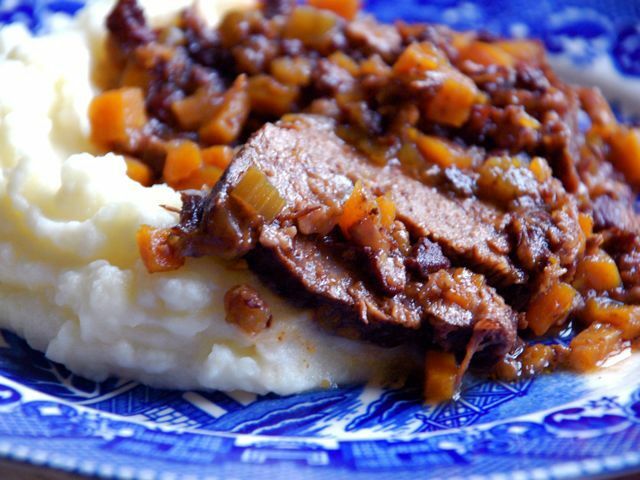 Refer to Kelly Myers' story on pot roast for many ways of incorporating leftovers from this dish into your weekly menu.